In the summer of 1993, gymnast Shannon Miller’s body stomped the growth accelerator — shooting up four inches. The 16-year-old who had won five Olympic medals just months earlier in Barcelona found herself quickly scrambling back to the drawing board. “Everything was a little bit off,” said Miller, 37. “Things I’d been doing for five years, suddenly I was having trouble with. It’s important to communicate with your coach and just kind of take a breath, stay calm and understand that it happens and work with it. You can actually become a better gymnast throughout those changes. 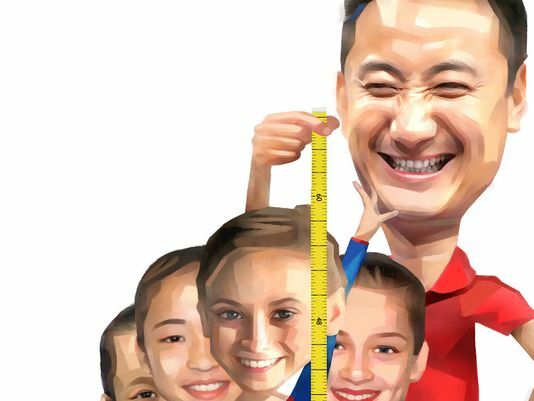 The strategy of size is considered by all gymnasts, including four elite competitors who train at Chow’s Gymnastics and Dance Institute in West Des Moines. Rachel Gowey, Norah Flatley, Victoria Nguyen and Alexis Vasquez will compete Saturday at the Secret U.S. Classic in Hoffman Estates, Ill. The event is a tune-up for the P&G Gymnastics Championships on Aug. 21-24 in Pittsburgh. The P&G serves as the U.S. national championship and part of the road Chow protégés Shawn Johnson and Gabby Douglas traveled on the way to Olympic gold medals. Miller and coach Steve Nunno adjusted to a transformation that ultimately added six inches and 30 pounds to produce two Olympic gold medals in Atlanta. Gowey is the tallest of the top Olympic contenders competing for Liang Chow, at 5-foot — or three inches taller than Johnson and an inch more than Douglas. A story on the Boston Globe’s Boston.com website published during the 2012 Games reported that 78 percent of medals in Olympic all-around since 1956 were awarded to gymnasts within three inches of 5 feet. Bela Karolyi, the former U.S. and Romanian Olympic coach who molded gold medalist such as Nadia Comaneci and Mary Lou Retton, told the Des Moines Register earlier this year that he considers Gowey and Flatley contenders for the 2016 Olympics in Rio de Janeiro. Gowey finished fifth in the senior division all-around at the prestigious City of Jesolo Trophy event in late March against a field packed with four of the top eight team finishers at the last Olympics — including bronze medal-winning Romania. Flatley won the junior division balance beam and finished third in the all-around at the same event. Karolyi said Flatley is the best junior athlete on balance beam in the United States. The height of gymnasts also can affect other areas, such as the center of gravity on balance beam. “It kind of comes down to simple physics,” Miller said. There is a limit to what works, however. “Like most sports, it kind of requires a general body type,” Miller said. “If you’re 6-foot-5, you’re probably not going to make the best gymnast. But growing can help in some cases. My coach, he would remind me, ‘Hey, this is a good thing. Now you can actually bend the springboard down’ on vault. Olympic and world champions, however, can come in a range of shapes and sizes, though. Miller pointed out that Russia’s Svetlana Khorkina — a seven-time Olympic medalist — shined on the biggest stage at 5-5, while Johnson and Retton (both 4-9) also climbed to the top of the medal stand. At the 2008 Olympics, debate flowed about how the more compact and powerful Johnson was judged against U.S. teammate Nastia Liukin. At 5-3 and nearly the same weight as Johnson, Luikin was characterized as more fluid, artistic and angular. Liukin won all-around gold as Johnson, the balance beam gold medalist, finished with the silver. Chow said the perception of Gowey’s size is part optical and ability-based illusion.